Surrounded by water but generously protected by New York Harbor, Manhattan was one of the founding port cities of America, bringing goods – and with them, wealth – into New York State and beyond. Today, the city’s rich shipping history may be but a memory, but the lively seafaring culture lives on at South Street Seaport, a beautiful and historic collection of shops, restaurants, and yes – really, really big boats, all nestled against the banks of the East River just south of the iconic Brooklyn Bridge. 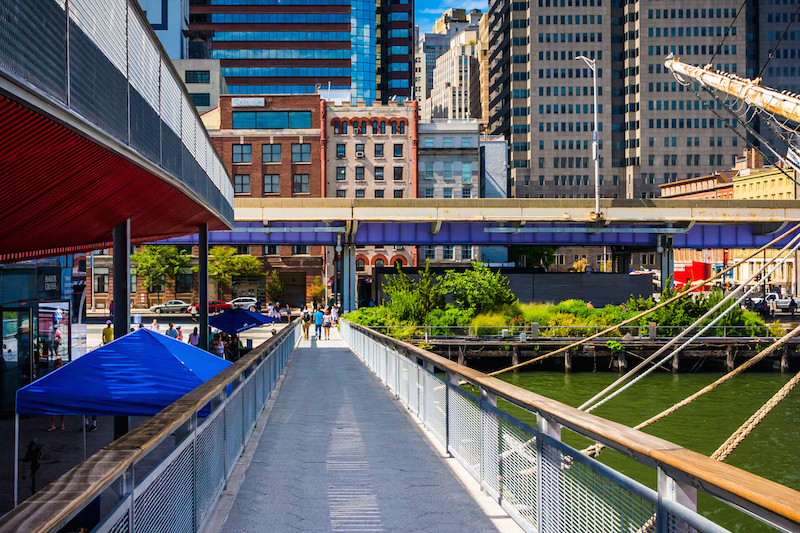 Once you’ve gotten to know a little about the long history of the seaport, flash forward to 2012 and the ongoing rebuilding process since Superstorm Sandy breached the East River and drove millions of gallons of brackish river water into the narrow cobblestoned streets and historic buildings. Today, many local businesses have reopened, so go on: patronize that cute shop or have a drink at that neat bar. You’re not just having a good time; you’re supporting the recovery of one of NYC’s most historic neighborhoods. Speaking of shopping, the seaport is a unique place to shop for gifts and souvenirs. NYC-based menswear label Rochambeau has a boutique at Seaport Studios (19 Fulton Street), where their outerwear-inspired fashions compete for attention with Brooklyn’s Union Surfboards and Glass swimming trunks – everything a guy could need for a seaside adventure. Nearby, Brother Vellies (4 Fulton Street) offers sustainable, artisanal footwear for both genders, plus kids, and L.O.L. Kids (216 Front Street) takes children’s style even further, with hats, scarves, and even formalwear. Grown-ups, on the other hand, will want to browse the hand-crafted jewelry at Stella Flame (21 Fulton Street), particularly the customizable “Your Story” amulet chains. Sister shop Farm Candy (21 Fulton Street) offers artisanal, custom-blended salts, sugars, and peppers that will dazzle home cooks. And if your NYC itinerary brings you back to Broadway, there’s also an outpost of Times Square’s famed TKTS Booth (199 Water Street), where you can score deeply discounted tickets to same-day shows. Once you’ve worked up an appetite, you’ll find no shortage of diverse and delicious eats, including a pop-up version of Brooklyn’s Smorgasburg (19 Fulton Street), inspired by the original food truck festival across the river, with eight trucks from Red Hook Lobster Pound, Milk Truck Grilled Cheese, Pizza Moto, and more. West Village stand-by Cowgirl operates a satellite seaport location, Cowgirl Sea-Horse (259 Front Street), and the East Village’s V-Bar runs V-Bar Seaport (212 Front Street), bringing the best bars from two classic NYC neighborhoods right to the riverfront. Speaking of the river, there’s no beating the views from Watermark (Pier 15), a bi-level, glass-enclosed bar and lounge that extends out from shore and into the water beneath the Brooklyn Bridge. For a similarly quintessential NYC experience, sample aged beef (and chilled martinis) at MarkJoseph Steakhouse (261 Water Street). And end – or start! – your visit with a pick-me-up at Jack’s Stir Brew Coffee (222 Front Street), another New York original famous for their labor-intensive and justly renowned java.